Springer once again has a campaign where some journals are free access to everyone until December 31. Included to the campaign are Springer’s climate science journals Climatic Change and Climate Dynamics. Some other interesting journals on related issues are also included. 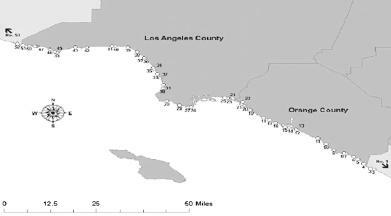 Estimating the potential economic impacts of climate change on Southern California beaches – Pendleton et al. (2011) “Climate change could substantially alter the width of beaches in Southern California. Climate-driven sea level rise will have at least two important impacts on beaches: (1) higher sea level will cause all beaches to become more narrow, all things being held constant, and (2) sea level rise may affect patterns of beach erosion and accretion when severe storms combine with higher high tides. To understand the potential economic impacts of these two outcomes, this study examined the physical and economic effects of permanent beach loss caused by inundation due to sea level rise of one meter and of erosion and accretion caused by a single, extremely stormy year (using a model of beach change based on the wave climate conditions of the El Niño year of 1982/1983.) We use a random utility model of beach attendance in Southern California that estimates the impacts of changes on beach width for different types of beach user visiting public beaches in Los Angeles and Orange Counties. The model allows beachgoers to have different preferences for beach width change depending on beach size. We find that the effect of climate-driven beach change differs for users that participate in bike path activities, sand-based activities, and water-based activities. We simulate the effects of climate-related beach loss on attendance patterns at 51 public beaches, beach-related expenditures at those beaches, and the non-market (consumer surplus) value of beach going to those beaches. We estimate that increasing sea level will cause an overall reduction of economic value in beach going, with some beaches experiencing increasing attendance and beach-related earnings while attendance and earnings at other beaches would be lower. We also estimate that the potential annual economic impacts from a single stormy year may be as large as those caused by permanent inundation that would result from a rise in sea level of one meter. The economic impacts of both permanent inundation and storm-related erosion are distributed unevenly across the region. To put the economic impacts of these changes in beach width in perspective, the paper provides simple estimates of the cost of mitigating beach loss by nourishing beaches with sand.” Linwood Pendleton, Philip King, Craig Mohn, D. G. Webster, Ryan Vaughn and Peter N. Adams, Climatic Change, DOI: 10.1007/s10584-011-0309-0. Potential impacts of increased coastal flooding in California due to sea-level rise – Heberger et al. (2011) “California is likely to experience increased coastal flooding and erosion caused by sea-level rise over the next century, affecting the state’s population, infrastructure, and environment. As part of a set of studies on climate change impacts to California, this paper analyzes the potential impacts from projected sea-level rise if no actions are taken to protect the coast (a “no-adaptation scenario”), focusing on impacts to the state’s population and infrastructure. Heberger et al. (2009) also covered effects on wetlands, costs of coastal defenses, and social and environmental justice related to sea-level rise. We analyzed the effect of a medium-high greenhouse gas emissions scenario (Special Report on Emissions Scenarios A2 in IPCC 2000) and included updated projections of sea-level rise based on work by Rahmstorf (Science 315(5810): 368, 2007). Under this scenario, sea levels rise by 1.4 m by the year 2100, far exceeding historical observed water level increases. By the end of this century, coastal flooding would, under this scenario, threaten regions that currently are home to approximately 480,000 people and $100 billion worth of property. Among those especially vulnerable are large numbers of low-income people and communities of color. A wide range of critical infrastructure, such as roads, hospitals, schools, emergency facilities, wastewater treatment plants, and power plants will also be at risk. Sea-level rise will inevitably change the character of California’s coast; practices and policies should be put in place to mitigate the potentially costly and life-threatening impacts of sea-level rise.” Matthew Heberger, Heather Cooley, Pablo Herrera, Peter H. Gleick and Eli Moore, Climatic Change, DOI: 10.1007/s10584-011-0308-1. A note on upscaling coniferous needle spectra to shoot spectral albedo – Rautiainen et al. (2011) “Mutual shading of needles in coniferous shoots and small-scale variations in needle area density both within and between shoots violate conventional assumptions used in the definition of the elementary volume in radiative transfer models. In this paper, we test the hypothesis if it is possible to scale needle spectral albedo up to shoot spectral albedo using only one structural parameter: the spherically averaged shoot silhouette to total area ratio (STAR). To test the hypothesis, we measured both structural and spectral properties of ten Scots pine (Pinus sylvestris) shoots and their needles. Our results indicate that it is possible to upscale from needle to shoot spectral albedo using STAR. The upscaling model performed best in the VIS and SWIR regions, and for shoots with high STAR values. As STAR is linearly related to photon recollision probability, it is also possible to apply the upscaling model as integral part of radiative transfer models.” Miina Rautiainen, Matti Mõttus, Lucia Yáñez-Rausell, Lucie Homolová, Zbyněk Malenovský, Michael E. Schaepman, Remote Sensing of Environment, doi:10.1016/j.rse.2011.10.019. Interannual to decadal variability of Atlantic Water in the Nordic and adjacent seas – Carton et al. (2011) “Warm salty Atlantic Water is the main source water for the Arctic Ocean and thus plays an important role in the mass and heat budget of the Arctic. This study explores interannual to decadal variability of Atlantic Water properties in the Nordic Seas area where Atlantic Water enters the Arctic, based on a reexamination of the historical hydrographic record for the years 1950–2009, obtained by combining multiple data sets. The analysis shows a succession of four multiyear warm events where temperature anomalies at 100 m depth exceed 0.4°C, and three cold events. 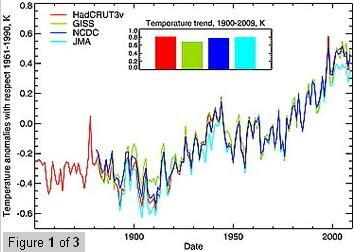 Three of the four warm events lasted 3–4 years, while the fourth began in 1999 and persists at least through 2009. This most recent warm event is anomalous in other ways as well, being the strongest, having the broadest geographic extent, being surface-intensified, and occurring under exceptional meteorological conditions. Three of the four warm events were accompanied by elevated salinities consistent with enhanced ocean transport into the Nordic Seas, with the exception of the event spanning July 1989–July 1993. Of the three cold events, two lasted for 4 years, while the third lasted for nearly 14 years. Two of the three cold events are associated with reduced salinities, but the cold event of the 1960s had elevated salinities. The relationship of these events to meteorological conditions is examined. The results show that local surface heat flux variations act in some cases to reinforce the anomalies, but are too weak to be the sole cause.” Carton, J. A., G. A. Chepurin, J. Reagan, and S. Häkkinen (2011), J. Geophys. Res., 116, C11035, doi:10.1029/2011JC007102. Global warming threatens the persistence of Mediterranean brown trout – Almodóvar et al. (2011) “Current climate change exacerbates the environmental restrictions on temperate species inhabiting low latitude edges of their geographical ranges. We examined how temperature variations due to current and future climate change are likely to affect populations’ persistence of stream-dwelling brown trout Salmo trutta at the vulnerable southern periphery of its range. Analysis of 33 years of air temperature data (1975-2007) by time-series models indicated a significant upward trend and a pronounced shift in air temperature around 1986-1987. This warming is associated with an ongoing population decline of brown trout, most likely caused by a loss of suitable thermal habitat in lower latitudes since the 1980s. Population decrease may not be attributed to physical habitat modification or angler pressure, since carrying capacity remained stable and populations were not overexploited. We developed regional temperature models, which predicted that unsuitable thermal habitat for brown trout increased by 93% when comparing climate conditions between 1975-1986 and 1993-2004. Predictions from climate envelope models showed that current climate change may be rendering unsuitable 12% of suitable thermal habitat each decade, resulting in an overall population decrease in the lower reaches of around 6% per year. Furthermore, brown trout catches markedly decreased 20% per year. Projections of thermal habitat loss under the ecologically friendly B2 SRES scenario showed that brown trout may lose half of their current suitable habitat within the study area by 2040 and become almost extinct by 2100. In parallel to the upstream movement of brown trout thermal habitat, warm water species are increasing their relative abundance in salmonid waters. Empirical evidence was provided of how current climate change threatens some of the most healthy native brown trout populations in Southern Europe and how forthcoming climate change is expected to further decrease the conservation status of the species.” Ana Almodóvar, Graciela G. Nicola, Daniel Ayllón, Benigno Elvira, Global Change Biology, DOI: 10.1111/j.1365-2486.2011.02608.x. Estimation of trends in extreme melt-season duration at Svalbard – Kvamstø et al. (2011) “A time series of monthly mean surface temperatures taken at Svalbard airport, Spitzbergen, for the period 1912–2010 was examined for changes in melt-season length. The annual melt-season length was constructed from daily temperature estimates based on the monthly data using smoothing splines. We argue that the changes in annual melt-season length are linked to variability in regional sea surface temperatures, the mean Northern Hemisphere surface temperature and the North Atlantic Oscillation (NAO) index. A regression model for the melt-season length with these three parameters as predictors, explained about 40% of the observed variance. The annual mean melt season for the period from 1912 to 2010 was estimated to be 108 days, and the linear trend was 0.17 days/year. The risk of having positive extremes in the melt season increased with increasing Northern Hemisphere surface temperature and the regional sea surface temperatures. On the basis of our study of past observations, the 100-year return length of the melt season at Svalbard was predicted to change from the current 95% confidence interval of 131 (108, 138) days to 175 (109, 242) days with 1 °C warming of both regional sea surface temperature and the mean Northern Hemisphere surface temperature.” Nils Gunnar Kvamstø, Dag Johan Steinskog, David B. Stephenson, Dag Bjarne Tjøstheim, International Journal of Climatology, DOI: 10.1002/joc.3395. Cold months in a warming climate – Räisänen & Ylhäisi (2011) “The frequency of cold months in the 21st century is studied using the CMIP3 ensemble of climate model simulations, using month-, location- and model-specific threshold temperatures derived from the simulated 20th century climate. Unsurprisingly, cold months are projected to become less common, but not non-existent, under continued global warming. As a multi-model mean over the global land area excluding Antarctica and under the SRES A1B scenario, 14% of the months during the years 2011–2050 are simulated to be colder than the 20th century median for the same month, 1.3% colder than the 10th percentile, and 0.1% record cold. The geographic and seasonal variations in the frequency of cold months are strongly modulated by variations in the magnitude of interannual variability. Thus, for example, cold months are most infrequently simulated over the tropical oceans where the variability is smallest, not over the Arctic where the warming is largest.” Räisänen, J. and J. S. Ylhäisi (2011), Geophys. Res. Lett., 38, L22704, doi:10.1029/2011GL049758. 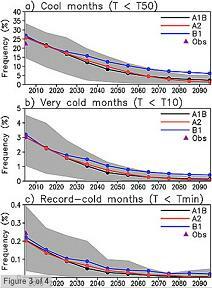 Skillful predictions of decadal trends in global mean surface temperature – Fyfe et al. (2011) “We compare observed decadal trends in global mean surface temperature with those predicted using a modelling system that encompasses observed initial condition information, externally forced response (due to anthropogenic greenhouse gases and aerosol precursors), and internally generated variability. We consider retrospective decadal forecasts for nine cases, initiated at five year intervals, with the first beginning in 1961 and the last in 2001. Forecast ensembles of size thirty are generated from differing but similar initial conditions. We concentrate on the trends that remain after removing the following natural signals in observations and hindcasts: dynamically induced atmospheric variability, El Nino-Southern Oscillation (ENSO), and the effects of explosive volcanic eruptions. We show that ensemble mean errors in the decadal trend hindcasts are smaller than in a parallel set of uninitialized free running climate simulations. The ENSO signal, which is skillfully predicted out to a year or so, has little impact on our decadal trend predictions, and our modelling system possesses skill, independent of ENSO, in predicting decadal trends in global mean surface temperature.” Fyfe, J. C., W. J. Merryfield, V. Kharin, G. J. Boer, W.-S. Lee, and K. von Salzen (2011), Geophys. Res. Lett., doi:10.1029/2011GL049508, in press. Attribution of climate change: a methodology to estimate the potential contribution to increases in potato yield in Scotland since 1960 – Gregory & Marshall (2011) “Maincrop potato yields in Scotland have increased by 30-35 t ha−1 since 1960 as a result of many changes, but has changing climate contributed anything to this? The purpose of this work was to answer this question. Daily weather data for the period 1960 to 2006 were analysed for five locations covering the zones of potato growing on the east coast of Scotland (between 55.213 and 57.646 N) to determine trends in temperature, rainfall and solar radiation. A physiologically-based potato yield model was validated using data obtained from a long-term field trial in eastern Scotland, and then employed to simulate crop development and potential yield at each of the five sites. Over the 47 years, there were significant increases in annual air and 30 cm soil temperatures (0.27 K decade−1 and 0.30 K decade−1 respectively), but no significant changes in annual precipitation or in the timing of the last frost in spring and the first frost of autumn. There was no evidence of any north to south gradient of warming. Simulated emergence and canopy closure became earlier at all five sites over the period with the advance being greater in the north (3.7 and 3.6 days decade−1 respectively) than the south (0.5 and 0.8 days decade−1 respectively). Potential yield increased with time, generally reflecting the increased duration of the green canopy, at average rates of 2.8 t ha−1 decade−1 for chitted seed (sprouted prior to planting) and 2.5 t ha−1 decade−1 for unchitted seed. The measured warming could contribute potential yield increases of up to 13.2 t ha−1 for chitted potato (range 7.1 – 19.3 t ha−1) and 11.5 t ha−1 for unchitted potato (range 7.1 – 15.5 t ha−1) equivalent to 34-39% of the increased potential yield over the period or 23-26% of the increase in actual measured yields.” P J Gregory, B Marshall, Global Change Biology, DOI: 10.1111/j.1365-2486.2011.02601.x. Do tropical plant species experience cold-ward range shifts with global warming? Distributional migrations, expansions, and contractions of tropical plant species as revealed in dated herbarium records – Feeley (2011) “Species are predicted to respond to global warming through “cold-ward” shifts in their geographic distributions due to encroachment into newly suitable habitats and/or dieback in areas that become climatically unsuitable. I conduct one of the first ever tests of this hypothesis for tropical plant species. I test for changes in the thermal distributions of 239 South American tropical plant species using dated herbarium records for specimens collected between 1970 and 2009. Supporting a priori predictions, many species (59%) exhibit some evidence of significant cold-ward range shifts even after correcting for collection biases. Over 1/3 of species (35%) show significant cold-ward movement in their hot thermal limits (mean rate of change = 0.022°C yr−1). Most of these species (85%; 30% of all study species) show no corresponding shift in their cold thermal limits. These unbalanced changes in the species’ thermal range limits may indicate species that are experiencing dieback due to their intolerance of rising temperatures coupled with an inability to expand into newly climatically-suitable habitats. On the other hand, 25% of species show significant cold-ward shifts in their cold thermal range limits (mean rate of change = 0.003°C yr−1), but 80% of these species (20% of all study species) show no corresponding shift in their hot thermal range limits. In these cases, the unbalanced shifts may indicate species that are able to “benefit” under global warming, at least temporally, by both tolerating rising temperatures and expanding into new suitable habitat. An important ancillary result of this study is that the number of species exhibiting significant range shifts was greatly influenced by shifting collector biases. This highlights the need to account for biases when analyzing natural history records or other long-term records.” Kenneth J. Feeley, Global Change Biology, DOI: 10.1111/j.1365-2486.2011.02602.x. Testing the robustness of semi-empirical sea level projections – Rahmstorf et al. (2011) “We determine the parameters of the semi-empirical link between global temperature and global sea level in a wide variety of ways, using different equations, different data sets for temperature and sea level as well as different statistical techniques. We then compare projections of all these different model versions (over 30) for a moderate global warming scenario for the period 2000–2100. We find the projections are robust and are mostly within ±20% of that obtained with the method of Vermeer and Rahmstorf (Proc Natl Acad Sci USA 106:21527–21532, 2009), namely ~1 m for the given warming of 1.8°C. Lower projections are obtained only if the correction for reservoir storage is ignored and/or the sea level data set of Church and White (Surv Geophys, 2011) is used. However, the latter provides an estimate of the base temperature T 0 that conflicts with the constraints from three other data sets, in particular with proxy data showing stable sea level over the period 1400–1800. Our new best-estimate model, accounting also for groundwater pumping, is very close to the model of Vermeer and Rahmstorf (Proc Natl Acad Sci USA 106:21527–21532, 2009).” Stefan Rahmstorf, Mahé Perrette and Martin Vermeer, Climate Dynamics, DOI: 10.1007/s00382-011-1226-7. Quantifying the impact of climate change on enteric waterborne pathogen concentrations in surface water – Hofstra (2011) “Climate change, among other factors, will impact waterborne pathogen concentrations in surface water worldwide, possibly increasing the risk of diseases caused by these pathogens. So far, the impacts are only determined qualitatively and thorough quantitative estimates of future pathogen concentrations have not yet been made. This review shows how changes in temperature and precipitation influence pathogen concentrations and gives opportunities to quantitatively explore the impact of climate change on pathogen concentrations using examples from ecological and hydrological modelling, already available statistical and process-based pathogen models and climate change scenarios. Such applications could indicate potential increased waterborne pathogen concentrations and guide further research.” Nynke Hofstra, Current Opinion in Environmental Sustainability, doi:10.1016/j.cosust.2011.10.006. Effects of acidified seawater on coral calcification and symbiotic algae on the massive coral Porites australiensis – Iguchi et al. (2011) “We investigated the effect of acidified seawater on calcification and symbiotic algae (zooxanthellae density, chlorophyll content per single algal cell, fluorescence yield (Fv/Fm)) on a massive coral, Porites australiensis, a common species in the Ryukyu Archipelago of Japan. We found that acidified seawater significantly decreased the calcification and fluorescence yield, but did not affect zooxanthellae density and chlorophyll content per single algal cell. This indicates low levels of photoacclimation to acidified seawater in this species, and this is contrary to the findings of previous studies of Acropora species. A significant correlation between calcification and fluorescence yield was observed, indicating the presence of a strong relationship between calcification and algal photosynthesis. Our results indicate that endosymbiont photosynthetic dysfunction may enhance the decrease of coral calcification in future acidified ocean conditions. Calcification and fluorescence yield among colonies clearly differed, showing that the response to acidified seawater is highly variable among colonies in natural coral populations.” Akira Iguchi, Saori Ozaki, Takashi Nakamura, Mayuri Inoue, Yasuaki Tanaka, Atsushi Suzuki, Hodaka Kawahata, Kazuhiko Sakai, Marine Environmental Research, doi:10.1016/j.marenvres.2011.10.008. Climate heterogeneity modulates impact of warming on tropical insects – Bonebrake & Deutsch (2011) “Evolutionary history and physiology mediate species responses to climate change. Tropical species that do not naturally experience high temperature variability have a narrow thermal tolerance compared to similar taxa at temperate latitudes, and could therefore be most vulnerable to warming. However, the thermal adaptation of a species may also be influenced by spatial temperature variations over its geographical range. Spatial climate gradients, especially from topography, may also broaden thermal tolerance and therefore act to buffer warming impacts. Here we show that for low seasonality environments, high spatial heterogeneity in temperature correlates significantly with greater warming tolerance in insects globally. Based on this relationship, we find that climate change projections of direct physiological impacts on insect fitness highlight the vulnerability of tropical lowland areas to future warming. Thus, in addition to seasonality, spatial heterogeneity may play a critical role in thermal adaptation and climate change impacts particularly in the tropics.” Bonebrake, Timothy Carlton, and Curtis A. Deutsch, Ecology, doi:10.1890/11-1187.1. Sensitivity of the attribution of near surface temperature warming to the choice of observational dataset – Jones & Stott (2011) “A number of studies have demonstrated that much of the recent warming in global near surface temperatures can be attributed to increases in anthropogenic greenhouse gases. While this conclusion has been shown to be robust in analyses using a variety of climate models there have not been equivalent studies using different available observational datasets. Here we repeat the analyses as reported previously using an updated observational dataset and other independently processed datasets of near surface temperatures. We conclude that the choice of observational dataset has little impact on the attribution of greenhouse gas warming and other anthropogenic cooling contributions to observed warming on a global scale over the 20th century, however this robust conclusion may not hold for other periods or for smaller sub-regions. Our results show that the dominant contributor to global warming over the last 50 years of the 20th century is that due to greenhouse gases.” Jones, G. S. and P. A. Stott (2011), Geophys. Res. Lett., 38, L21702, doi:10.1029/2011GL049324. 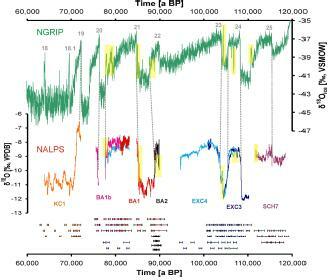 High variability of Greenland surface temperature over the past 4000 years estimated from trapped air in an ice core – Kobashi et al. (2011) “Greenland recently incurred record high temperatures and ice loss by melting, adding to concerns that anthropogenic warming is impacting the Greenland ice sheet and in turn accelerating global sea-level rise. Yet, it remains imprecisely known for Greenland how much warming is caused by increasing atmospheric greenhouse gases versus natural variability. To address this need, we reconstruct Greenland surface snow temperature variability over the past 4000 years at the GISP2 site (near the Summit of the Greenland ice sheet; hereafter referred to as Greenland temperature) with a new method that utilises argon and nitrogen isotopic ratios from occluded air bubbles. The estimated average Greenland snow temperature over the past 4000 years was −30.7°C with a standard deviation of 1.0°C and exhibited a long-term decrease of roughly 1.5°C, which is consistent with earlier studies. The current decadal average surface temperature (2001–2010) at the GISP2 site is −29.9°C. The record indicates that warmer temperatures were the norm in the earlier part of the past 4000 years, including century-long intervals nearly 1°C warmer than the present decade (2001–2010). Therefore, we conclude that the current decadal mean temperature in Greenland has not exceeded the envelope of natural variability over the past 4000 years, a period that seems to include part of the Holocene Thermal Maximum. Notwithstanding this conclusion, climate models project that if anthropogenic greenhouse gas emissions continue, the Greenland temperature would exceed the natural variability of the past 4000 years sometime before the year 2100.” Kobashi, T., K. Kawamura, J. P. Severinghaus, J.-M. Barnola, T. Nakaegawa, B. M. Vinther, S. J. Johnsen, and J. E. Box (2011), Geophys. Res. Lett., 38, L21501, doi:10.1029/2011GL049444. The vertical distribution of climate forcings and feedbacks from the surface to top of atmosphere – Previdi & Liepert (2011) “The radiative forcings and feedbacks that determine Earth’s climate sensitivity are typically defined at the top-of-atmosphere (TOA) or tropopause, yet climate sensitivity itself refers to a change in temperature at the surface. In this paper, we describe how TOA radiative perturbations translate into surface temperature changes. It is shown using first principles that radiation changes at the TOA can be equated with the change in energy stored by the oceans and land surface. This ocean and land heat uptake in turn involves an adjustment of the surface radiative and non-radiative energy fluxes, with the latter being comprised of the turbulent exchange of latent and sensible heat between the surface and atmosphere. We employ the radiative kernel technique to decompose TOA radiative feedbacks in the IPCC Fourth Assessment Report climate models into components associated with changes in radiative heating of the atmosphere and of the surface. (We consider the equilibrium response of atmosphere-mixed layer ocean models subjected to an instantaneous doubling of atmospheric CO2). It is shown that most feedbacks, i.e., the temperature, water vapor and cloud feedbacks, (as well as CO2 forcing) affect primarily the turbulent energy exchange at the surface rather than the radiative energy exchange. Specifically, the temperature feedback increases the surface turbulent (radiative) energy loss by 2.87 W m−2 K−1 (0.60 W m−2 K−1) in the multimodel mean; the water vapor feedback decreases the surface turbulent energy loss by 1.07 W m−2 K−1 and increases the surface radiative heating by 0.89 W m−2 K−1; and the cloud feedback decreases both the turbulent energy loss and the radiative heating at the surface by 0.43 and 0.24 W m−2 K−1, respectively. Since changes to the surface turbulent energy exchange are dominated in the global mean sense by changes in surface evaporation, these results serve to highlight the fundamental importance of the global water cycle to Earth’s climate sensitivity.” Michael Previdi and Beate G. Liepert, Climate Dynamics, DOI: 10.1007/s00382-011-1233-8. Geomagnetic South Atlantic Anomaly and global sea level rise: a direct connection? – De Santis et al. (2011) “We highlight the existence of an intriguing and to date unreported relationship between the surface area of the South Atlantic Anomaly (SAA) of the geomagnetic field and the current trend in global sea level rise. These two geophysical variables have been growing coherently during the last three centuries, thus strongly suggesting a causal relationship supported by some statistical tests. The monotonic increase of the SAA surface area since 1600 may have been associated with an increased inflow of radiation energy through the inner Van Allen belt with a consequent warming of the Earth’s atmosphere and finally global sea level rise. An alternative suggestive and original explanation is also offered, in which pressure changes at the core-mantle boundary cause surface deformations and relative sea level variations. Although we cannot establish a clear connection between SAA dynamics and global warming, the strong correlation between the former and global sea level supports the idea that global warming may be at least partly controlled by deep Earth processes triggering geomagnetic phenomena, such as the South Atlantic Anomaly, on a century time scale.” A. De Santis, E. Qamili, G. Spada, P. Gasperini, Journal of Atmospheric and Solar-Terrestrial Physics, doi:10.1016/j.jastp.2011.10.015. On the long-term context of the 1997–2009 ‘Big Dry’ in South-Eastern Australia: insights from a 206-year multi-proxy rainfall reconstruction – Gergis et al. (2011) “This study presents the first multi-proxy reconstruction of rainfall variability from the mid-latitude region of south-eastern Australia (SEA). A skilful rainfall reconstruction for the 1783–1988 period was possible using twelve annually-resolved palaeoclimate records from the Australasian region. An innovative Monte Carlo calibration and verification technique is introduced to provide the robust uncertainty estimates needed for reliable climate reconstructions. Our ensemble median reconstruction captures 33% of inter-annual and 72% of decadal variations in instrumental SEA rainfall observations. We investigate the stability of regional SEA rainfall with large-scale circulation associated with El Niño–Southern Oscillation (ENSO) and the Inter-decadal Pacific Oscillation (IPO) over the past 206 years. We find evidence for a robust relationship with high SEA rainfall, ENSO and the IPO over the 1840–1988 period. These relationships break down in the late 18th–early 19th century, coinciding with a known period of equatorial Pacific Sea Surface Temperature (SST) cooling during one of the most severe periods of the Little Ice Age. In comparison to a markedly wetter late 18th/early 19th century containing 75% of sustained wet years, 70% of all reconstructed sustained dry years in SEA occur during the 20th century. In the context of the rainfall estimates introduced here, there is a 97.1% probability that the decadal rainfall anomaly recorded during the 1998–2008 ‘Big Dry’ is the worst experienced since the first European settlement of Australia.” Joëlle Gergis, Ailie Jane Eyre Gallant, Karl Braganza, David John Karoly, Kathryn Allen, Louise Cullen, Rosanne D’Arrigo, Ian Goodwin, Pauline Grierson and Shayne McGregor, Climatic Change, DOI: 10.1007/s10584-011-0263-x. A contribution to attribution of recent global warming by out-of-sample Granger causality analysis – Attanasio et al. (2011) “The topic of attribution of recent global warming is usually faced by studies performed through global climate models (GCMs). Even simpler econometric models have been applied to this problem, but they led to contrasting results. In this article, we show that a genuine predictive approach of Granger analysis leads to overcome problems shown by these models and to obtain a clear signal of linear Granger causality from greenhouse gases (GHGs) to the global temperature of the second half of the 20th century. 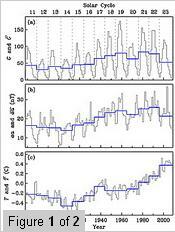 In contrast, Granger causality is not evident using time series of natural forcing.” Alessandro Attanasio, Antonello Pasini, Umberto Triacca, Atmospheric Science Letters, DOI: 10.1002/asl.365. This is a list of papers on bird and bat mortality caused by wind power. Also studies on wind power effects to other animals can be included. The list is not complete, and will most likely be updated in the future in order to make it more thorough and more representative. Novel Scavenger Removal Trials Increase Wind Turbine—Caused Avian Fatality Estimates – Smallwood et al. (2010) “For comparing impacts of bird and bat collisions with wind turbines, investigators estimate fatalities/megawatt (MW) of rated capacity/year, based on periodic carcass searches and trials used to estimate carcasses not found due to scavenger removal and searcher error. However, scavenger trials typically place ≥10 carcasses at once within small areas already supplying scavengers with carcasses deposited by wind turbines, so scavengers may be unable to process and remove all placed carcasses. To avoid scavenger swamping, which might bias fatality estimates low, we placed only 1–5 bird carcasses at a time amongst 52 wind turbines in our 249.7-ha study area, each carcass monitored by a motion-activated camera. Scavengers removed 50 of 63 carcasses, averaging 4.45 days to the first scavenging event. By 15 days, which corresponded with most of our search intervals, scavengers removed 0% and 67% of large-bodied raptors placed in winter and summer, respectively, and 15% and 71% of small birds placed in winter and summer, respectively. By 15 days, scavengers removed 42% of large raptors as compared to 15% removed in conventional trials, and scavengers removed 62% of small birds as compared to 52% removed in conventional trials. Based on our methodology, we estimated mean annual fatalities caused by 21.9 MW of wind turbines in Vasco Caves Regional Preserve (within Altamont Pass Wind Resource Area, California, USA) were 13 red-tailed hawks (Buteo jamaicensis), 12 barn owls (Tyto alba), 18 burrowing owls (Athene cunicularia), 48 total raptors, and 99 total birds. Compared to fatality rates estimated from conventional scavenger trials, our estimates were nearly 3 times higher for red-tailed hawk and barn owl, 68% higher for all raptors, and 67% higher for all birds. We also found that deaths/gigawatt-hour of power generation declined quickly with increasing capacity factor among wind turbines, indicating collision hazard increased with greater intermittency in turbine operations. Fatality monitoring at wind turbines might improve by using scavenger removal trials free of scavenger swamping and by relating fatality rates to power output data in addition to rated capacity (i.e., turbine size). The resulting greater precision in mortality estimates will assist wildlife managers to assess wind farm impacts and to more accurately measure the effects of mitigation measures implemented to lessen those impacts.” K. Shawn Smallwood, Douglas A. Bell, Sara A. Snyder, Joseph E. Didonato, The Journal of Wildlife Management, Volume 74, Issue 5, pages 1089–1096, July 2010, DOI: 10.2193/2009-266. Influence of Behavior on Bird Mortality in Wind Energy Developments – Smallwood et al. (2009) “As wind power generation is rapidly expanding worldwide, there is a need to understand whether and how preconstruction surveys can be used to predict impacts and to place turbines to minimize impacts to birds. Wind turbines in the 165-km2 Altamont Pass Wind Resource Area (APWRA), California, USA, cause thousands of bird fatalities annually, including hundreds of raptors. To test whether avian fatality rates related to rates of utilization and specific behaviors within the APWRA, from March 1998 to April 2000 we performed 1,959 30-minute behavior observation sessions (360° visual scans using binoculars) among 28 nonoverlapping plots varying from 23 ha to 165 ha in area and including 10–67 turbines per plot, totaling 1,165 turbines. Activity levels were highly seasonal and species specific. Only 1% of perch time was on towers of operating turbines, but 22% was on towers of turbines broken, missing, or not operating. Of those species that most often flew through the rotor zone, fatality rates were high for some (e.g., 0.357 deaths/megawatt of rated capacity [MW]/yr for red-tailed hawk [Buteo jamaicensis] and 0.522 deaths/MW/yr for American kestrel [Falco sparverius]) and low for others (e.g., 0.060 deaths/MW/yr for common raven [Corvus corax] and 0.012 deaths/MW/yr for turkey vulture [Cathartes aura]), indicating specific behaviors or visual acuity differentiated these species by susceptibility to collision. Fatality rates did not correlate with utilization rates measured among wind turbine rows or plots for any species except burrowing owl (Athene cunicularia) and mallard (Anas platyrhynchos). However, mean monthly fatality rates of red-tailed hawks increased with mean monthly utilization rates (r2 = 0.67) and especially with mean monthly flights through turbine rows (r2 = 0.92). Fatality rates increased linearly with rates of utilization (r2 = 0.99) and flights near rotor zones (r2 = 1.00) for large raptor species and with rates of perching (r2 = 0.13) and close flights (r2 = 0.77) for small non-raptor species. Fatalities could be minimized or reduced by shutting down turbines during ≥1 season or in very strong winds or by leaving sufficiently large areas within a wind farm free of wind turbines to enable safer foraging and travel by birds.” K. Shawn Smallwood, Lourdes Rugge, Michael L. Morrison, The Journal of Wildlife Management, Volume 73, Issue 7, pages 1082–1098, September 2009, DOI: 10.2193/2008-555. Bird Mortality in the Altamont Pass Wind Resource Area, California – Smallwood & Thelander (2008) “The 165-km2 Altamont Pass Wind Resource Area (APWRA) in west-central California includes 5,400 wind turbines, each rated to generate between 40 kW and 400 kW of electric power, or 580 MW total. Many birds residing or passing through the area are killed by collisions with these wind turbines. We searched for bird carcasses within 50 m of 4,074 wind turbines for periods ranging from 6 months to 4.5 years. Using mortality estimates adjusted for searcher detection and scavenger removal rates, we estimated the annual wind turbine–caused bird fatalities to number 67 (80% CI = 25–109) golden eagles (Aquila chrysaetos), 188 (80% CI = 116–259) red-tailed hawks (Buteo jamaicensis), 348 (80% CI = −49 to 749) American kestrels (Falco sparverius), 440 (80% CI = −133 to 1,013) burrowing owls (Athene cunicularia hypugaea), 1,127 (80% CI = −23 to 2,277) raptors, and 2,710 (80% CI = −6,100 to 11,520) birds. Adjusted mortality estimates were most sensitive to scavenger removal rate, which relates to the amount of time between fatality searches. New on-site studies of scavenger removal rates might warrant revising mortality estimates for some small-bodied bird species, although we cannot predict how the mortality estimates would change. Given the magnitude of our mortality estimates, regulatory agencies and the public should decide whether to enforce laws intended to protect species killed by APWRA wind turbines, and given the imprecision of our estimates, directed research is needed of sources of error and bias for use in studies of bird collisions wherever wind farms are developed. Precision of mortality estimates could be improved by deploying technology to remotely detect collisions and by making wind turbine power output data available to researchers so that the number of fatalities can be related directly to the actual power output of the wind turbine since the last fatality search.” K. Shawn Smallwood, Carl Thelander, The Journal of Wildlife Management, Volume 72, Issue 1, pages 215–223, January 2008, DOI: 10.2193/2007-032. Patterns of Bat Fatalities at Wind Energy Facilities in North America – Arnett et al. (2008) “Wind has become one of the fastest growing sources of renewable energy worldwide, but widespread and often extensive fatalities of bats have increased concern regarding the impacts of wind energy development on bats and other wildlife. We synthesized available information on patterns of bat fatalities from a review of 21 postconstruction fatality studies conducted at 19 facilities in 5 United States regions and one Canadian province. Dominance of migratory, foliage- and tree-roosting lasiurine species (e.g., hoary bat [Lasiurus cinereus]) killed by turbines was consistent among studies. Bat fatalities, although highly variable and periodic, consistently peaked in late summer and fall, coinciding with migration of lasiurines and other species. A notable exception was documented fatalities of pregnant female Brazilian freetailed bats (Tadarida brasiliensis) in May and June at a facility in Oklahoma, USA, and female silver-haired bats (Lasionycteris noctivagans) during spring in Tennessee, USA, and Alberta, Canada. Most studies reported that fatalities were distributed randomly across turbines at a site, although the highest number of fatalities was often found near the end of turbine strings. Two studies conducted simultaneously in the same region documented similar timing of fatalities between sites, which suggests broader patterns of collisions dictated by weather, prey abundance, or other factors. None of the studies found differences in bat fatalities between turbines equipped with lighting required by the Federal Aviation Administration and turbines that were unlit. All studies that addressed relationships between bat fatalities and weather patterns found that most bats were killed on nights with low wind speed (<6 m/sec) and that fatalities increased immediately before and after passage of storm fronts. Weather patterns may be predictors of bat activity and fatality; thus, mitigation efforts that focus on these high-risk periods could reduce bat fatality substantially. We caution that estimates of bat fatality are conditioned by length of study and search interval and that they are biased in relation to how searcher efficiency, scavenger removal, and habitat differences were or were not accounted for. Our review will assist managers, biologists, and decision-makers with understanding unifying and unique patterns of bat fatality, biases, and limitations of existing efforts, and it will aid in designing future research needed to develop mitigation strategies for minimizing or eliminating bat fatality at wind facilities.” Edward B. Arnett, W. Kent Brown, Wallace P. Erickson, Jenny K. Fiedler, Brenda L. Hamilton, Travis H. Henry, Aaftab Jain, Gregory D. Johnson, Jessica Kerns, Rolf R. Koford, Charles P. Nicholson, Timothy J. O’Connell, Martin D. Piorkowski, Roger D. Tankersley JR., The Journal of Wildlife Management, Volume 72, Issue 1, pages 61–78, January 2008, DOI: 10.2193/2007-221. Estimating Wind Turbine-Caused Bird Mortality – Smallwood (2007) “Mortality estimates are needed of birds and bats killed by wind turbines because wind power generation is rapidly expanding worldwide. A mortality estimate is based on the number of fatalities assumed caused by wind turbines and found during periodic searches, plus the estimated number not found. The 2 most commonly used estimators adjust mortality estimates by rates of searcher detection and scavenger removal of carcasses. However, searcher detection trials can be biased by the species used in the trial, the number volitionally placed for a given fatality search, and the disposition of the carcass on the ground. Scavenger removal trials can be biased by the metric representing removal rate, the number of carcasses placed at once, the duration of the trial, species used, whether carcasses were frozen, whether carcasses included injuries consistent with wind turbine collisions, season, distance from the wind turbines, and general location. I summarized searcher detection rates among reported trials, and I developed models to predict the proportion of carcasses remaining since the last fatality search. The summaries I present can be used to adjust previous and future estimates of mortality to improve comparability. I also identify research directions to better understand these and other adjustments needed to compare mortality estimates among wind farms.” K. Shawn Smallwood, The Journal of Wildlife Management, Volume 71, Issue 8, pages 2781–2791, November 2007, DOI: 10.2193/2007-006. See also other papers in Ibis special issue. Collision Mortality of Local and Migrant Birds at a Large-Scale Wind-Power Development on Buffalo Ridge, Minnesota – Johnson et al. (2002) “In 1994 Xcel Energy initiated a wind-power development project in southwestern Minnesota that will eventually produce 425 megawatts (MW) of electricity. During our study the wind farm consisted of 3 phases of development totaling 354 turbines capable of generating 236 MW, depending on wind speed. We assessed effects of the wind farm on birds from 1996 to 1999, with 55 documented collision fatalities. Recovered carcasses included 42 passerines, 5 waterbirds, 3 ducks, 3 upland game birds, 1 raptor, and 1 shorebird. Most fatalities (71%) were likely migrants through the area, 20% were species that likely were breeding in the study area, and 9% were permanent residents. Wind farm-related mortality was estimated by extrapolating the number of carcasses found at a sample of the turbines and adjusting for scavenger removal and searcher efficiency rates. We estimated total annual mortality at 72 (90% Cl = 36-108) in the Phase 1 wind farm, 324 (90% Cl = 175-473) in the Phase 2 wind farm, and 613 (90% Cl = 132-1093) in the Phase 3 wind farm. The Phase 3 wind-farm estimate was based on 1 year of data and was largely influenced by a single mortality event involving 14 passerines at 2 adjacent turbines during 1 night. Radar data indicated that approximately 3.5 million birds migrate over the wind farm each year; however, the proportion of birds flying at heights susceptible to turbine collisions is not known. Wind-power development will likely contribute to cumulative collision mortality of birds in the United States.” Gregory D. Johnson, Wallace P. Erickson, M. Dale Strickland, Maria F. Shepherd, Douglas A. Shepherd and Sharon A. Sarappo, Wildlife Society Bulletin, Vol. 30, No. 3 (Autumn, 2002), pp. 879-887. Effects of Wind Turbines on Upland Nesting Birds in Conservation Reserve Program Grasslands – Leddy et al. (1999) “Grassland passerines were surveyed during summer 1995 on the Buffalo Ridge Wind Resource Area in southwestern Minnesota to determine the relative influence of wind turbines on overall densities of upland nesting birds in Conservation Reserve Program (CRP) grasslands. Birds were surveyed along 40 m fixed width transects that were placed along wind turbine strings within three CRP fields and in three CRP fields without turbines. Conservation Reserve Program grasslands without turbines and areas located 180 m from turbines supported higher densities (261.0-312.5 males/100 ha) of grassland birds than areas within 80 m of turbines (58.2-128.0 males/100 ha). Human disturbance, turbine noise, and physical movements of turbines during operation may have distrurbed nesting birds. We recommend that wind turbines be placed within cropland habitats that support lower densities of grassland passerines than those found in CRP grasslands.” Krecia L. Leddy, Kenneth F. Higgins and David E. Naugle, The Wilson Bulletin, Vol. 111, No. 1 (Mar., 1999), pp. 100-104. Some (worms) like it hot: fish parasites grow faster in warmer water, and alter host thermal preferences – Macnab & Barber (2011) “Elevated environmental temperatures associated with anthropogenic warming have the potential to impact host-parasite interactions, with consequences for population health and ecosystem functioning. One way that elevated temperatures might influence parasite prevalence and intensity is by increasing life cycle completion rates. Here we investigate how elevated temperatures impact a critical phase of the life cycle of the bird tapeworm Schistocephalus solidus – the growth of plerocercoid larvae in host sticklebacks Gasterosteus aculeatus. By 8 weeks post-infection, plerocercoids recovered from experimentally infected sticklebacks held at 20C weighed on average 104.9mg, with all exceeding 50mg, the mass considered consistently infective to definitive hosts. In contrast, plerocercoids from sticklebacks held at 15C weighed on average 26.5mg, with none exceeding 50mg. Because small increases in plerocercoid mass affect adult fecundity disproportionately in this species, enhanced plerocercoid growth at higher temperatures predicts dramatically increased output of infective parasite stages. Subsequent screening of thermal preferences of sticklebacks from a population with endemic S. solidus infection demonstrated that fish harbouring infective plerocercoids show significant preferences for warmer temperatures. Our results therefore indicate that parasite transmission might be affected in at least two ways under anthropogenic warming; by enhancing rates of parasite growth and development, and by increasing the likelihood of hosts being able to seek out proliferating warmer microhabitats. Furthermore, our results suggest the potential for positive feedback between parasite growth and host thermal preferences, which could dramatically increase the effects of even small temperature increases. We discuss the possible mechanisms underpinning our results, their likely ecological consequences and highlight key areas for further research.” Vicki Macnab, Iain Barber, Global Change Biology, DOI: 10.1111/j.1365-2486.2011.02595.x. Comment on “Why Hasn’t Earth Warmed as Much as Expected?” by Schwartz et al. 2010 – Knutti & Plattner (2011) “In a recent paper, Schwartz et al. suggest that (1) over the last century the Earth has warmed less than expected, and they discuss several factors that could explain the discrepancy, including climate sensitivity estimates and aerosol forcing. Schwartz et al. then continue to (2) estimate the allowed carbon emissions for stabilization of global temperature, and find that given the uncertainty in the climate sensitivity even the sign of these allowed carbon emissions is unknown, implying that past emissions may already have committee the Earth to two degrees warming for a best estimate value of climate sensitivity of 3 K. We take issue with both of these conclusions in the Schwartz et al. study and show here that (1) in contrast to Schwartz et al., current assessments of climate sensitivity, radiative forcing and thermal disequilibrium do not support the claim of a discrepancy between expected and observed warming; and (2) the allowed emissions estimated by Schwartz et al. are in conflict with results from a hierarchy of climate-carbon cycle models and strongly underestimated due to erroneous assumptions about the behavior of the carbon cycle and a confusion of the relevant timescales.” Reto Knutti and Gian-Kasper Plattner, Journal of Climate 2011, doi: 10.1175/2011JCLI4038.1. Link to Schwartz et al. reply (no abstract or full text freely available). Integrating knowledge and management regarding the climate–malaria linkages in Colombia – Poveda et al. (2011) “Malaria is a complex multi-factorial disease whose outcomes are affected by climate and environmental variability. In particular, malaria is endemic in the year-round hot and humid lowlands of Colombia, whose hydro-climatology exhibits clear-cut variability at interannual timescales, mostly driven by both phases of El Niño/Southern Oscillation (ENSO): El Niño (warm phase) and La Niña (cold phase). Here we show highly significant statistical correlations between malaria outbreaks in Colombia during historical El Niño events of 1959–2009. Analyses are performed at national, regional, and municipal spatial scales, and at annual, quarterly, and monthly timescales. Annual malaria incidence in Colombia exhibits a combination of long-term trends (which might be explained by historical increasing trends in average air temperatures throughout Colombia, in turn owing to global warming and deforestation), as well as strong malaria outbreaks during El Niño, as a consequence of the concomitant increases in air temperature. Also, we show that satellite imagery of vegetation activity can be used as an environmental indicator for malaria in Colombia. We discuss how these research results and diverse knowledge-based tools, including mathematical explanatory models and geographical information systems, are being used by the Colombian health authorities as an end-to-end program and early warning system (EWS) for malaria prevention and surveillance countrywide.” Germán Poveda, Óscar A Estrada-Restrepo, Julián E Morales, Ólver O Hernández, Armando Galeano, Salua Osorio, Current Opinion in Environmental Sustainability, doi:10.1016/j.cosust.2011.10.004. Modelling the potential impact of climate variability and change on species regeneration potential in the temperate forests of South-Eastern Australia – Mok et al. (2011) “The sensitivity of early plant regeneration to environmental change makes regeneration a critical stage for understanding species response to climate change. We investigated the spatial and temporal response of eucalypt trees in the Central Highland region of south eastern Australia to high and low climate change scenarios. We developed a novel mechanistic model incorporating germination processes, TACA-GEM, to evaluate establishment probabilities of five key eucalypt species, Eucalyptus pauciflora, E. delegatensis, E. regnans, E. nitens, and E. obliqua. Changes to regeneration potential at landscape and site levels were calculated to determine climate thresholds. Model results demonstrated that climate change is likely to impact on plant regeneration. We observed increases and decreases of regeneration potential depending on the ecosystem, indicating that some species will increase in abundance in some forest types whilst other forest types will become inhabitable. In general the dry forest ecosystems were most impacted whilst the wet forests were least impacted. We also observed that species with seed dormancy mechanisms, like E. pauciflora and E. delegatensis, are likely to be at higher risk than those without. Landscape and site level analysis revealed heterogeneity in species response at different scales. On a landscape scale, a 4.3°C mean temperature increase and 22% decline in precipitation (predicted for 2080) is predicted to be a threshold for large spatial shifts in species regeneration niches across the study region, while a 2.6°C increase and 15% decline in precipitation (predicted for 2050) will likely result in local site-level shifts. Site-level analysis showed that considerable declines in regeneration potential for E. delegatensis, E. pauciflora, and E. nitens were modelled to occur in some ecosystems by 2050. While overall model performance and accuracy was good, better understanding of effects from extreme events and other underlying processes on regeneration will improve modelling and development of species conservation strategies.” Hoi-Fei Mok, Craig R. Nitschke, Stefan K. Arndt, Global Change Biology, DOI: 10.1111/j.1365-2486.2011.02591.x. Correlation between climate sensitivity and aerosol forcing and its implication for the “climate trap” – Tanaka & Raddatz (2011) “Climate sensitivity and aerosol forcing are dominant uncertain properties of the global climate system. Their estimates based on the inverse approach are interdependent as historical temperature records constrain possible combinations. Nevertheless, many literature projections of future climate are based on the probability density of climate sensitivity and an independent aerosol forcing without considering the interdependency of such estimates. Here we investigate how large such parameter interdependency affects the range of future warming in two distinct settings: one following the A1B emission scenario till the year 2100 and the other assuming a shutdown of all greenhouse gas and aerosol emissions in the year 2020. We demonstrate that the range of projected warming decreases in the former case, but considerably broadens in the latter case, if the correlation between climate sensitivity and aerosol forcing is taken into account. Our conceptual study suggests that, unless the interdependency between the climate sensitivity and aerosol forcing estimates is properly considered, one could underestimate a risk involving the “climate trap”, an unpalatable situation with a high climate sensitivity in which a very drastic mitigation may counter-intuitively accelerate the warming by unmasking the hidden warming due to aerosols.” Katsumasa Tanaka and Thomas Raddatz, Climatic Change, DOI: 10.1007/s10584-011-0323-2. Solar and volcanic fingerprints in tree-ring chronologies over the past 2000 years – Breitenmoser et al. (2011) “The Sun is the main driver of Earth’s climate, yet the Sun’s role in forcing decadal-to-centennial climate variations has remained controversial, especially in the context of understanding contributions of natural climate forcings to continuing global warming. To properly address long-term fingerprints of solar forcing on climate, long-term, very high-resolution, globally distributed climate proxy records are necessary. In this study we compile and evaluate a near global collection of annually-resolved tree-ring-based climate proxies spanning the past two millennia. We statistically assess these records in both the time and frequency domains for solar forcing (i.e. 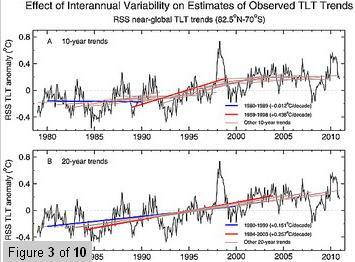 Total Solar Irradiance; TSI) and climate variability with emphasis on centennial time scales. Analyses in the frequency domain indicate significant periodicities in the 208-year frequency band, corresponding to the DeVries cycle of solar activity. Additionally, results from superposed epoch analysis (SEA) point toward a possible solar contribution in the temperature and precipitation series. However, solar-climate associations remain weak, with for example no clear linkage distinguishable in the southwestern United States drought records at centennial time scales. Other forcing factors, namely volcanic activity, appear to mask the solar signal in space and time. To investigate this hypothesis, we attempted to extract volcanic signals from the temperature proxies using a statistical modelling approach. Wavelet analysis of the volcanic contribution reveals significant periodicities near the DeVries frequency during the Little Ice Age (LIA). This remarkable and coincidental superposition of the signals makes it very difficult to separate volcanic and solar forcing during the LIA. Nevertheless, the “volcano free” temperature records show significant periodicities near the DeVries periodicity during the entire past 1500 years, further pointing to solar mechanisms and emphasising the need for solar related studies in the absence of strong multi-decadal volcanic forcing.” Petra Breitenmoser, Jürg Beer, Stefan Brönnimann, David Frank, Friedhelm Steinhilber, Heinz Wanner, Palaeogeography, Palaeoclimatology, Palaeoecology, doi:10.1016/j.palaeo.2011.10.014. This is a list of papers dealing with different aspects of the health effects of increased carbon dioxide. The list contains subsections for general studies, increasing atmospheric CO2 and allergies, and extreme carbon dioxide events. The list is not complete, and will most likely be updated in the future in order to make it more thorough and more representative. UPDATE (April 11, 2013): New section for atmospheric carbon dioxide and allergies added including 10 papers. UPDATE (November 9, 2011): Robertson (2006) added. High carbon dioxide concentrations in the classroom: the need for research on the effects of children’s exposure to poor indoor air quality at school – Miller et al. (2010) “Air quality and its effect on health have received recent attention from the House of Commons Environmental Audit Committee. 1 While outdoor air pollution is clearly important and contributes to indoor air quality, indoor air pollution sources and the time spent in indoor environments are key to understanding exposure.” Janice Miller, Sean Semple, Stephen Turner, Occup Environ Med 2010;67:799 doi:10.1136/oem.2010.057471. Occupational hazards of carbon dioxide exposure – Scott et al. (2009) “This paper is an overview of the occupational hazards that result from exposure to carbon dioxide. It details the main uses, characteristics, and problems that have been identified when carbon dioxide is utilized in various working environments. Carbon dioxide is always a danger when present in enclosed spaces at elevated concentrations. Situations resulting from acute and chronic exposures involving the gaseous and dry ice forms of carbon dioxide are discussed in detail. Current rationale concerning exposure limits and monitoring recommendations are highlighted.” Jonathan L. Scott, David G. Kraemer, Randal J. Keller, Journal of Chemical Health and Safety, Volume 16, Issue 2, March-April 2009, Pages 18-22, doi:10.1016/j.jchas.2008.06.003. Carbon Dioxide Poisoning – Langford (2005) “Carbon dioxide is a physiologically important gas, produced by the body as a result of cellular metabolism. It is widely used in the food industry in the carbonation of beverages, in fire extinguishers as an `inerting’ agent and in the chemical industry. Its main mode of action is as an asphyxiant, although it also exerts toxic effects at cellular level. At low concentrations, gaseous carbon dioxide appears to have little toxicological effect. At higher concentrations it leads to an increased respiratory rate, tachycardia, cardiac arrhythmias and impaired consciousness. Concentrations >10% may cause convulsions, coma and death. Solid carbon dioxide may cause burns following direct contact. If it is warmed rapidly, large amounts of carbon dioxide are generated, which can be dangerous, particularly within confined areas. The management of carbon dioxide poisoning requires the immediate removal of the casualty from the toxic environment, the administration of oxygen and appropriate supportive care. In severe cases, assisted ventilation may be required. Dry ice burns are treated similarly to other cryogenic burns, requiring thawing of the tissue and suitable analgesia. Healing may be delayed and surgical intervention may be required in severe cases.” Langford, Nigel J., Toxicological Reviews, Volume 24, Number 4, 2005 , pp. 229-235(7). Indoor Air Quality Investigations at Five Classrooms – Lee & Chang (1999) “Five classrooms, air-conditioned or naturally ventilated, at five different schools were chosen for comparison of indoor and outdoor air quality. Temperature, relative humidity (RH), carbon dioxide (CO2), sulphur dioxide (SO2), nitric oxide (NO), nitrogen dioxide (NO2), particulate matter with diameter less than 10 mm (PM10), formaldehyde (HCHO), and total bacteria counts were monitored at indoor and outdoor locations simultaneously. Respirable particulate matter was found to be the worst among parameters measured in this study. The indoor and outdoor average PM10 concentrations exceeded the Hong Kong standards, and the maximum indoor PM10 level was even at 472 μ;g/m3. Air cleaners could be used in classrooms to reduce the high PM10 concentration. Indoor CO2 concentrations often exceeded 1,000 μl/l indicating inadequate ventilation. Lowering the occupancy and increasing breaks between classes could alleviate the high CO2 concentrations. Though the maximum indoor CO2 level reached 5,900 μl/l during class at one of the sites, CO2 concentrations were still at levels that pose no health threats.” S. C. Lee, Maureen Chang, Indoor Air, Volume 9, Issue 2, pages 134–138, June 1999, DOI: 10.1111/j.1600-0668.1999.t01-2-00008.x. Effects of sustained low-level elevations of carbon dioxide on cerebral blood flow and autoregulation of the intracerebral arteries in humans – Sliwka et al. (1998) “Cerebral blood flow velocity (CBFv) was measured by insonating the middle cerebral arteries of four subjects using a 2 Mhz transcranial Doppler. Ambient CO2 was elevated to 0.7% for 23 d in the first study and to 1.2% for 23 d in the same subjects in the second study. By non-parametric testing CBFv was elevated significantly by +35% above pre-exposure levels during the first 1-3 d at both exposure levels, after which CBFv progressively readjusted to pre-exposure levels. Despite similar CBFv responses, headache was only reported during the initial phase of exposure to 1.2% CO2. Vascular reactivity to CO2 assessed by rebreathing showed a similar pattern with the CBFv increases early in the exposures being greater than those elicited later. An increase in metabolic rate of the visual cortex was evoked by having the subjects open and close their eyes during a visual stimulus. Evoked CBFv responses measured in the posterior cerebral artery were also elevated in the first 1-3 d of both studies returning to pre-exposure levels as hypercapnia continued. Cerebral vascular autoregulation assessed by raising head pressure during 10 degrees head-down tilt both during the low-level exposures and during rebreathing was unaltered. There were no changes in the retinal microcirculation during serial fundoscopy studies. The time-dependent changes in CO2 vascular reactivity might be due either to retention of bicarbonate in brain extracellular fluid or to progressive increases in ventilation, or both. Cerebral vascular autoregulation appears preserved during chronic exposure to these low levels of ambient CO2.” Sliwka U, Krasney JA, Simon SG, Schmidt P, Noth J., Aviat Space Environ Med. 1998 Mar;69(3):299-306. Sick Building Syndrome Symptoms among the Staff in Schools and Kindergartens: are the Levels of Volatile Organic Compounds and Carbon Dioxide Responsible? – Willers et al. (1996) “From a large questionnaire-based survey investigating the indoor air quality (IAQ) in 48 schools and 74 kindergartens, 21 schools were selected for mea surements of volatile organic compounds (VOC) and carbon dioxide (CO2) based on the prevalence of sick building syndrome (SBS) symptoms reported by the staff. The 10 schools with the lowest prevalence of SBS symptoms ‘healthy’) were compared to 11 schools with the highest prevalence (‘sick’; median value showing twice as many SBS symptoms reported). The concen trations of total VOCs (TVOC) in schools and kindergartens were low and within suggested guidelines. The levels of CO2 were higher than suggested guidelines in several cases. However, neither TVOC nor CO2 concentrations were associated with SBS symptoms. Thus, TVOC and CO2 concentrations do not seem to be useful as SBS risk indicators.” Stefan Willers, Sven Andersson, Rolf Andersson, Jörgen Grantén, Christina Sverdrup, Lars Rosell, Indoor and Built Environment July 1996 vol. 5 no. 4 232-235, doi: 10.1177/1420326X9600500406. Effects of carbon dioxide inhalation on psychomotor and mental performance during exercise and recovery – Sheehy et al. (1982) “Psychomotor and mental tests involving reaction time, rotor pursuit, short-term memory for digits and letters, and reasoning ability were administered to subjects inhaling up to 5% CO2 in air and in gas mixtures containing 50% O2. The psychomotor and mental tests were given during the 6 min of recovery following 10 min of treadmill running at 80% of aerobic capacity. Although the subjects inhaled the CO2 during the entire exercise and recovery period there was no difference in performance between the CO2 inhalation condition and the control condition for any of the performance measures.” Sheehy, J B; Kamon, E; Kiser, D., Human Factors. Vol. 24, pp. 581-588. Oct. 1982. Effects on man of high concentrations of carbon dioxide in relation to various oxygen pressures during exposures as long as 72 hours – Consolazio et al. (1947) No abstract. W. V. Consolazio, M. B. Fisher, N. Pace, I. J. Pecora, G. C. Pitts, A. R. Behnke, American Journal of Physiology, November 1947 vol. 151 no. 2 479-503. Changes in Atmospheric CO2 Influence the Allergenicity of Aspergillus fumigatus – Lang-Yona et al. (2013) “Increased susceptibility to allergies has been documented in the Western world in recent decades. However, a comprehensive understanding of its causes is not yet available. It is therefore essential to understand trends and mechanisms of allergy-inducing agents, such as fungal conidia. In this study we investigated the hypothesis that environmental conditions linked to global atmospheric changes can affect the allergenicity of Aspergillus fumigatus, a common allergenic fungal species in indoor and outdoor environments and in airborne particulate matter. We show that fungi grown under present day CO2 levels (392 ppm) exhibit 8.5 and 3.5 fold higher allergenicity compared to fungi grown at preindustrial (280 ppm) and double (560 ppm) CO2 levels, respectively. A corresponding trend is observed in the expression of genes encoding for known allergenic proteins and in the major allergen Asp f1 concentrations, possibly due to physiological changes such as respiration rates and the nitrogen content of the fungus, influenced by the CO2 concentrations. Increased carbon and nitrogen levels in the growth medium also lead to a significant increase in the allergenicity. We propose that climatic changes such as increasing atmospheric CO2 levels and changes in the fungal growth medium may impact the ability of allergenic fungi such as Aspergillus fumigatus to induce allergies.” Naama Lang-Yona, Yishai Levin, Karen C. Dannemiller, Oded Yarden, Jordan Peccia, Yinon Rudich, Global Change Biology, DOI: 10.1111/gcb.12219. Anthropogenic climate change and allergen exposure: The role of plant biology – Ziska & Beggs (2012) “Accumulation of anthropogenic gases, particularly CO2, is likely to have 2 fundamental effects on plant biology. The first is an indirect effect through Earth’s increasing average surface temperatures, with subsequent effects on other aspects of climate, such as rainfall and extreme weather events. The second is a direct effect caused by CO2-induced stimulation of photosynthesis and plant growth. Both effects are likely to alter a number of fundamental aspects of plant biology and human health, including aerobiology and allergic diseases, respectively. This review highlights the current and projected effect of increasing CO2 and climate change in the context of plants and allergen exposure, emphasizing direct effects on plant physiologic parameters (eg, pollen production) and indirect effects (eg, fungal sporulation) related to diverse biotic and abiotic interactions. Overall, the review assumes that future global mitigation efforts will be limited and suggests a number of key research areas that will assist in adapting to the ongoing challenges to public health associated with increased allergen exposure.” Lewis H. Ziska, Paul J. Beggs, Journal of Allergy and Clinical Immunology, Volume 129, Issue 1, January 2012, Pages 27–32, http://dx.doi.org/10.1016/j.jaci.2011.10.032. Increased levels of airborne fungal spores in response to Populus tremuloides grown under elevated atmospheric CO2 – Klironomos et al. (1997) “Soil fungi are important components of terrestrial ecosystems. They function as decomposers, pathogens, parasites, and mutualistic symbionts. Their main mode of dispersal is to liberate spores into the atmosphere. In this study we tested the hypothesis that a higher atmospheric CO2 concentration will induce greater sporulation in common soil fungi, leading to higher concentrations of fungal propagules in the atmosphere. In our field experiment, the concentration of airborne fungal propagules, mostly spores, increased fourfold under twice-ambient CO2 concentrations. Analysis of decomposing leaf litter (likely the main source of airborne fungal propagules) indicated that the fungi produced fivefold more spores under elevated CO2. Our results provide evidence that elevations in atmospheric CO2 concentration can directly affect microbial function, which may have important implications for litter decay, fungal dispersal, and human respiratory health. Key words: atmospheric CO2, fungal spores, global change, Populus tremuloides.” John N. Klironomos, Matthias C. Rillig, Michael F. Allen, Donald R. Zak, Kurt S. Pregitzer, Mark E. Kubiske, Canadian Journal of Botany, 1997, 75(10): 1670-1673, 10.1139/b97-880. This section lists papers on some extreme events where carbon dioxide has caused deaths or serious harm. It should be noted that this is not very relevant to the carbon dioxide levels associated with current global warming. 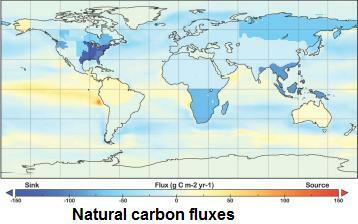 However, for some carbon capture and storage scenarios these events serve as practical examples to what happens during high local carbon dioxide levels. Non-volcanic CO2 Earth degassing: Case of Mefite d’Ansanto (southern Apennines), Italy – Chiodini et al. (2010) “Mefite d’Ansanto, southern Apennines, Italy is the largest natural emission of low temperature CO2 rich gases, from non-volcanic environment, ever measured in the Earth. The emission is fed by a buried reservoir, made up of permeable limestones and covered by clayey sediments. We estimated a total gas flux of ~2000 tons per day. Under low wind conditions, the gas flows along a narrow natural channel producing a persistent gas river which has killed over a period of time people and animals. The application of a physical numerical model allowed us to define the zones which potentially can be affected by dangerous CO2 concentration at breathing height for humans.” Chiodini, G., D. Granieri, R. Avino, S. Caliro, A. Costa, C. Minopoli, and G. Vilardo (2010), Geophys. Res. Lett., 37, L11303, doi:10.1029/2010GL042858. Asphyxiation Due to Dry Ice in a Walk-in Freezer – Dunford et al. (2009) “Background: Exposure to a high concentration of environmental carbon dioxide (CO2) can result in poisoning through direct toxicity and by displacing atmospheric oxygen (O2). Dry ice undergoes sublimation to a gaseous state at −78.5°C (−109.3°F), which is heavier than air and can accumulate in dependent areas. Case Report: We report the case of a 59-year-old man found in cardiac arrest shortly after entering a recently repaired walk-in freezer that contained dry ice. First responders and bystanders did not recognize the proximate hazardous environment but were fortunately uninjured. A careful Emergency Department history coupled with rapid case investigation by the Medical Examiner’s Office led to the determination of the cause of death and the elimination of the ongoing hazard. Conclusion: This case illustrates the lethal consequences of improper storage of dry ice and the need to consider toxic environmental exposure as a cause of sudden cardiac arrest.” James V. Dunford, Jon Lucas, Nick Vent, Richard F. Clark, F. Lee Cantrell, The Journal of Emergency Medicine, Volume 36, Issue 4, May 2009, Pages 353-356, doi:10.1016/j.jemermed.2008.02.051. Recent pH and CO2 profiles at Lakes Nyos and Monoun, Cameroon: implications for the degassing strategy and its numerical simulation – Kusakabe et al. (2000) “In situ pH profiles are reported for the first time for Lakes Nyos and Monoun. The pH profiles were converted to CO2 profiles using HCO3− profiles calculated from conductivity data. Recent observations (1993–1996) at Lake Nyos indicates that CO2 still accumulates below 180 m depth at a rate of 125 Mmol year−1. At Lake Monoun, the majority of CO2 is present below a depth of 60 m, only 25 m below the saturation depth. Consequently, a potential danger of gas explosion is high at both lakes, and artificial degassing of the lakes should be performed as soon as possible. A system for industrial degassing of the lakes is proposed. The system, based on the self-sustained gas lift principle, consists of multiple pipes (14 cm in diameter) with different intake depths; 12 pipes for Lake Nyos (four each at 185, 195 and 205 m) and three pipes for Lake Monoun (at 70, 80 and 90 m). The stepped degassing at different depths is intended to keep the maximum stability of the lakes. The proposed degassing operation was simulated using the dyresm code for both lakes. In 5 years, approximately 50% of currently dissolved CO2 in Lake Nyos and 90% in Lake Monoun will be removed. The expected changes in the thermal and chemical structures of the lakes as degassing proceeds will be most easily monitored with a carefully calibrated CTD equipped with a pH sensor. The simulation indicates that the discharged degassed water will sink to a level of neutral buoyancy, i.e. to a maximum of 70 m at Lake Nyos and 35 m at Lake Monoun. There would be no possibility of triggering a gas explosion by this plunge of discharged water because the water present there would have already been replaced by water at lower CO2 concentration, during the degassing from shallower pipes.” M Kusakabe, G.Z Tanyileke, S.A McCord, S.G Schladow, Journal of Volcanology and Geothermal Research, Volume 97, Issues 1-4, April 2000, Pages 241-260, doi:10.1016/S0377-0273(99)00170-5. Possible asphyxiation from carbon dioxide of a cross-country skier in eastern California: a deadly volcanic hazard – Hill (2000) “This report describes an incident in which exceedingly high levels of carbon dioxide may have contributed to the death of a skier in eastern California. A cross-country skier was found dead inside a large, mostly covered snow cave, 1 day after he was reported missing. The autopsy report suggests that the skier died of acute pulmonary edema consistent with asphyxiation; carbon dioxide measurements inside the hole in which he was found reached 70%. This area is known for having a high carbon dioxide flux attributed to degassing of a large body of magma (molten rock) 10 to 20 km beneath the ski area. The literature describes many incidents of fatal carbon dioxide exposures associated with volcanic systems in other parts of the world. We believe this case represents the first reported death associated with volcanically produced carbon dioxide in the United States. Disaster and wilderness medicine specialists should be aware of and plan for this potential health hazard associated with active volcanoes.” Peter M. Hill, Wilderness & Environmental Medicine, Volume 11, Issue 3, September 2000, Pages 192-195, doi:10.1580/1080-6032(2000)011[0192:PAFCDO]2.3.CO;2. Fatal intoxication due to an unexpected presence of carbon dioxide – Guillemin & Horisberger (1994) “A fatal accident which occurred in a tank containing a sludge made of wine and activated charcoal is described. Similar accidents in the wine industry seem to have never been reported before. Initially, the cause of death was not obvious and became clear only after the autopsy confirmed the presence of a very high concentration of carbon dioxide in blood. It is shown in this paper how the concentration of carbon dioxide in the tank could be estimated from its solubility in water, assuming a realistic content of this gas in the wine remaining in the sludge. Moreover the accident was analysed by the fault tree method which revealed that, as well as the deficiencies in risk management of such companies, the unsuspected presence of carbon dioxide played a significant role.” Michel P. Guillemin and B. Horisberger, Ann Occup Hyg (1994) 38 (6): 951-957. doi: 10.1093/annhyg/38.6.951. CO2-rich gases from Lakes Nyos and Monoun, Cameroon; Laacher See, Germany; Dieng, Indonesia, and Mt. Gambier, Australia—variations on a common theme – Giggenbach et al. (1991) “Helium (RA = 3.0 to 5.6) and carbon (δ13C from −7.2 to −3.4‰) isotopic compositions, and relative CO2, CH4, N2, He and Ar contents of CO2-rich gases from Lakes Nyos and Monoun, Cameroon; Laacher See, Germany; Dieng Volcanic Plateau, Indonesia, and a well at Mt. Gambier, Australia, point to a common, essentially magmatic origin. … Otherwise, gas may accumulate to form a stable pocket (Mt. Gambier). Minor leakage from such pockets may lead to surface discharges of CO2-rich gases as at Laacher See, re-absorption into shallow groundwater to the formation of the low-salinity, CO2-charged waters encountered at Lakes Nyos and Monoun. The occurrence of these high-CO2, low-temperature systems is likely to be favored in tectonically active regions, allowing deep, possibly mantle gases to rise, but with sufficiently low regional heat flows to prevent the establishment of large-scale geothermal activity.” W.F. Giggenbach, Y. Sano, H.U. Schmincke, Journal of Volcanology and Geothermal Research, Volume 45, Issues 3-4, April 1991, Pages 311-323, doi:10.1016/0377-0273(91)90065-8. Water and gas chemistry of Lake Nyos and its bearing on the eruptive process – W.F. Giggenbach (1990) “The isotopic and chemical composition of water samples collected from Lake Nyos some two and eight weeks after the eruption of August 21, 1986 point to the existence of three distinct mixing regimes involving three water components. An essentially homogeneous, unmixed body of water at depths > 100 m, overlain by water increasingly affected by surface evaporation and a 5–10-m layer containing recent, but pre-eruption rain water. The cationic constituents (Na, K, Mg, Ca, Mn, Fe) of the lake water correspond to the dissolution of around 0.1 g of local rock, the waters are close to saturation with respect to siderite. The composition of the gas dissolved in the deep lake waters (0.65% b.w. of CO2, PCO2 = 4.4b) corresponds (in mmol mol−1) to 996 CO2, 2.0 CH4, 2.0 N2, 0.05 Ar, 0.004 He, 0.0002 H2, 0.0001 Ne, < 0.01 O2, < 0.004 H2S, < 0.001 CO. The isotopic compositions of CO2 (δ13C = -3.4‰) and of He (Rair = 5.5) suggest deep magmatic origins, the 13C and 2H content of CH4 organic sedimentary origin, the presence of aromatic hydrocarbons indicates very high temperatures of hydrocarbon formation. Exsolution of gas will first lead to the precipitation of siderite then iron hydroxide. The chemistry of the lake waters points to a loss of some 240,000 t of CO2 from the upper 100 m of the lake, their isotopic composition is consistent with the assumption that the eruption was triggered by the accumulation of cold rain waters at the lake surface prior to the eruption inducing partial convective overturn. There is no need to invoke addition of chemical or isotopic constituents from deeper levels during the eruption.” W.F. Giggenbach, Journal of Volcanology and Geothermal Research, Volume 42, Issue 4, 15 August 1990, Pages 337-362, doi:10.1016/0377-0273(90)90031-A. The Lake Nyos gas disaster: chemical and isotopic evidence in waters and dissolved gases from three Cameroonian crater lakes, Nyos, Monoun and Wum – Kusakabe et al. (1989) “To better understand the cause of the Nyos gas disaster of August 21, 1986, we conducted geochemical and limnological surveys in October 1986, of three lakes (Nyos, Monoun and Wum) which are located in the Cameroon volcanic zone that is characterized by a prevalence of young alkaline basalts and basanitoids. … The August 1986 gas bursts from Lake Nyos were most likely caused by rapid exsolution of dissolved CO2 within the lake; an explosive process such as a phreatic eruption or a CO2 gas-jetting from beneath the bottom is unlikely because of low concentrations of Cl− and SO42−, no oxygen isotopic shift, low turbidity, and no reported perturbation of the bottom sediments. Exsolution of CO2 bubbles could occur if CO2-saturated bottom water was displaced upwards by an increased influx of high salinity water from the bottom during the rainy season. Exsolution of CO2 at the upper layers was possibly accelerated by upwelling of a two-phase fluid (CO2 bubbles and solution), a mechanism known as a pneumatic lift pump, resulting in discharge of a large amount of CO2 gas. The H2S concentration in the gas cloud must have been kept far below the lethal level because of a high Fe2+ concentration of the lake water.” Minoru Kusakabe, Takashi Ohsumi, Shigeo Aramaki, Journal of Volcanology and Geothermal Research, Volume 39, Issues 2-3, November 1989, Pages 167-185, doi:10.1016/0377-0273(89)90056-5. The gas cloud of Lake Nyos (Cameroon, 1986): Results of the Italian technical mission – Barberi et al. (1989) “On August 21, 1986, a gas cloud issued from Lake Nyos in Cameroon killed over 1700 people. An Italian technical mission reached the area seven days later and obtained the first field evidences of the catastrophe. On the basis of observations and measurements in the field and of samples collected, the origin of the gas outburst is attributed to a phreatic explosion from beneath the bed of the lake. This interpretation appears to fit well the observed and reported phenomena, and seems perfectly consistent with the geological-geothermal conditions of the area.” F. Barberi, W. Chelini, G. Marinelli, M. Martini, Journal of Volcanology and Geothermal Research, Volume 39, Issues 2-3, November 1989, Pages 125-134, doi:10.1016/0377-0273(89)90053-X. Mechanisms of the Nyos carbon dioxide disaster and of so-called phreatic steam eruptions – Tazieff (1989) “During the night of August 21, 1986, a huge volume of concentrated CO2 was emitted by the crater (maar) of Nyos, Cameroon. It killed more than 1700 people and all animal life as far as 14 km away. Two hypotheses have been put forward to account for this disaster. The chronologically first one imputes it to have been a phreatic eruption, exceptionally CO2-rich, as had been the case in February 1979 on the Diëng Plateau in Central Java, Indonesia, where the erupting crater was lake-less. The second one claims a limnic origin for the CO2 release, through an overturn of the 220 m-deep Lake Nyos, the hypolimnium of which was supposed to be oversaturated by dissolved gas of volcanic origin. The present paper points to six observed facts for which the eruptive hypothesis easily accounts, and which the authors of the limnic one do ignore.” Haroun Tazieff, Journal of Volcanology and Geothermal Research, Volume 39, Issues 2-3, November 1989, Pages 109-116, doi:10.1016/0377-0273(89)90051-6. Origin of carbon dioxide emanation from the 1979 Dieng eruption, Indonesia: Implications for the origin of the 1986 Nyos catastrophe – Allard et al. (1989) “In February 1979, CO2 emanations accompanying a phreatic eruption killed 142 people at Dieng volcano, Central Java. The gas emitted was nearly pure carbon dioxide, with subordinate amounts of methane and sulfur compounds. … It is proposed that magmatic carbon dioxide, accumulated beneath the Dieng volcanic complex, was the source of the lethal gas, the effusion of which was triggered by the pressure release generated by the phreatic eruption. The total CO2 discharge of the 1979 Dieng event might have approached 0.1 km3, i.e. close to the lower output estimated for the 1986 Nyos catastrophe. The Dieng example demonstrates that expansion and then effusion of pure magmatic carbon dioxide, accumulated at shallow levels beneath volcanoes, may account for a major hazard from phreatic eruptions, be it a trigger or only a consequence of the eruptions.” P. Allard, D. Dajlevic, C. Delarue, Journal of Volcanology and Geothermal Research, Volume 39, Issues 2-3, November 1989, Pages 195-206, doi:10.1016/0377-0273(89)90058-9. Medical evaluation of the victims of the 1986 Lake Nyos disaster – Wagner et al. (1988) “A cloud of carbon dioxide gas, with an estimated volume of 1 km3 was released from Lake Nyos, a volcanic crater lake in Cameroon, Africa, causing 1700 to 2000 human fatalities as well as killing thousands of livestock and wild animals. At the request of the Cameroonian Government, the Office of Foreign Disaster Assistance of the U.S. Department of State sent a multidisciplinary team which included 2 forensic pathologists to assist the Government of Cameroon in investigating this natural disaster. The medical evaluation was concentrated in 3 areas: the autopsy of human and animal fatalities, examination and interview of survivors, and examination of the scene of the disaster. Toxicologic specimens were obtained at autopsy, and numerous samples of lake water were collected. The autopsy findings were consistent with asphyxia. The results of chemical analyses excluded many volatiles but not carbon dioxide as the toxic agent. The exact source of this gas continues to be a subject of a heated geologic debate, but fermentation of organic materials in the lake water has been eliminated on the basis of C14 isotope studies. This investigation underlines the value of forensic pathologists in epidemiological studies and in the examination of living persons.” Wagner GN, Clark MA, Koenigsberg EJ, Decata SJ., J Forensic Sci. 1988 Jul;33(4):899-909. The 1986 Lake Nyos Gas Disaster in Cameroon, West Africa – Kling et al. (1987) “The sudden, catastrophic release of gas from Lake Nyos on 21 August 1986 caused the deaths of at least 1700 people in the northwest area of Cameroon, West Africa. Chemical, isotopic, geologic, and medical evidence support the hypotheses that (i) the bulk of gas released was carbon dioxide that had been stored in the lake’s hypolimnion, (ii) the victims exposed to the gas cloud died of carbon dioxide asphyxiation, (iii) the carbon dioxide was derived from magmatic sources, and (iv) there was no significant, direct volcanic activity involved. The limnological nature of the gas release suggests that hazardous lakes may be identified and monitored and that the danger of future incidents can be reduced.” George W. Kling, Michael A. Clark, Glen N. Wagner, Harry R. Compton, Alan M. Humphrey, Joseph D. Devine, William C. Evans, John P. Lockwood, Michele L. Tuttle and Edward J. Koenigsberg, Science 10 April 1987: Vol. 236 no. 4798 pp. 169-175, DOI: 10.1126/science.236.4798.169. Origin of the lethal gas burst from Lake Monoun, Cameroun – Sigurdsson et al. (1987) “On 15 August, 1984, a lethal gas burst issued from a submerged 96-m-deep crater in Lake Monoun in Cameroun, western Africa, killing 37 people. The event was associated with a landslide from the eastern crater rim, which slumped into deep water. … Gases effervescing from depressurized deep waters are dominantly CO2 with minor CH4, having δ13C of −7.18 and −54.8 per mil, respectively. … The resultant ebullition of CO2 from deep lake waters led to a gas burst at the surface and locally generated a water wave up to 5 m high. People travelling through the gas cloud were asphyxiated, presumably from CO2, and suffered skin discoloration from unidentified components.” H. Sigurdsson, J.D. Devine, F.M. Tchua, F.M. Presser, M.K.W. Pringle, W.C. Evans, Journal of Volcanology and Geothermal Research, Volume 31, Issues 1-2, March 1987, Pages 1-16, doi:10.1016/0377-0273(87)90002-3. An example of health hazard: People killed by gas during a phreatic eruption: Diëng plateau (Java, Indonesia), February 20th 1979 – Le Guern et al. (1982) “On February 20th, 1979, 142 inhabitants of Dieng Plateau (Indonesia) were asphyxiated by poisonous gases during a mild phreatic eruption. From later fields gas collection and analysis, the casualties are considered to be due to CO2 rich volcanic gases.” F. Le Guern, H. Tazieff and R. Faivre Pierret, Bulletin of Volcanology, Volume 45, Number 2, 153-156, DOI: 10.1007/BF02600430.